It’s school holidays. This means laziness and lots of TV for Greg Heffley, aka the Wimpy Kid. Greg’s enjoyment is cut short by mum’s announcement that a family road trip is planned. She describes it as a ‘bonding experience’. That starts warning bells ringing. Dad goes out for milk and comes back with a boat that he plans to hook to the van. His deepest longing is realized. So begins another story that joins to many others like links in a chain. As they set out in their van, hauling dad’s rotted boat full of belongings, the laughs never end, nor does the chaos and confusion. Lessons are learnt the hard way, when they are learnt at all. In a stinky motel room carrying a pig that Manny wins at a fair, they get robbed by the obnoxious Beardos. Roderick is forced to continue with one shoe, after losing the other to the smelliest shoe contest, and later, they are attacked by hungry seagulls through the roof of the van. A wrong turn sees them join a funeral procession and the list goes on. The disasters are never ending. At times, the happenings are truly gross. 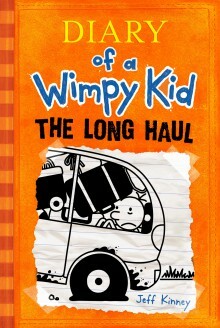 The Heffleys life, although more than slightly off balance, is full of adventures, which become our adventures as well. I set out on one each time I open a Wimpy Kid book. I travel to unexplored places in Greg’s mind and imagination, and share the hilarious, unbelievable, and incredible with the Heffleys. I suspend disbelief to lighten my mood and enjoy a laugh. Thank you, Jeff Kinney! This is Book 9 and the film tie-in, which is currently showing in cinemas around Australia.